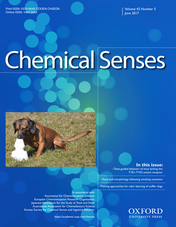 Chemical Senses publishes original research and review papers on all aspects of chemoreception in both humans and animals. An important part of the journal's coverage is devoted to techniques and the development and application of new methods for investigating chemoreception and chemosensory structures. The current Editor-in-Chief is Wolfgang Meyerhof. View the full editorial board on the Chemical Senses website. Complete online archive of the journal. Rapid publication. Average review time is only FOUR WEEKS, and accepted papers are published online in final format within FOUR WEEKS of acceptance. Impact Factor of 3.157; 5-Year Impact Factor of 3.199. Full compatibility with the NIH Public Access policy for NIH grantees. An open access option for authors. International readership. More than 4,000 institutions worldwide and all AChemS members have access to the journal. High usage, with more than 35,000 full-text downloads of Chemical Senses articles per month.